Euro Media Group (EMG) is building on its work to date in the future of sports broadcast IP production by subscribing to a capital increase in SDNsquare, giving it a minority position. SDNsquare provides solutions to solve storage and networking challenges. This partnership supports EMG’s ambition to build one of the most future-proof IP-based media production solutions on the market. 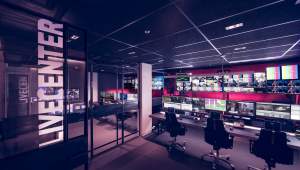 Through its project, OBjective 2020, EMG aims to change the concept of outside broadcasting by designing an IP based scalable and modular workflow. Built around small data centres that can be mobile, fixed or hosted, EMG is aiming to provide solutions anywhere in the world it is needed, to be used as an OB-truck, as a build-out, or for remote production, and in any size from standard HD productions up to the biggest UHD multi-venue event. SDNsquare’s clients, typically in media environments, require networks that are reliable, predictable and easy to manage. In a world that is moving rapidly to IP, SDNsquare’s Grid media controller enables the automatic management and configuration of an IP media network, with guaranteed data flows or media flows.